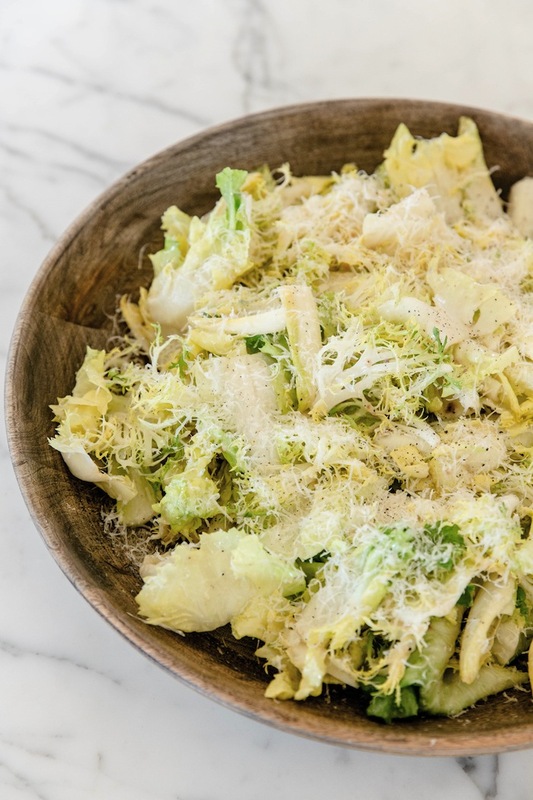 This show-stopping salad by our friends at San Francisco's amazing Foreign Cinema restaurant celebrates winter greens and one of the best Caesar dressings we’ve had. If escarole isn’t available, sub radicchio. Or just go with good old romaine, if you like. Don’t be afraid to use the raw egg in the dressing—just be sure it's fresh, make the dressing right before you serve it, and eat the salad within an hour of when you serve it. Also, the dressing is still outstanding without the cheese, so confidently omit it if you're dairy-free. Remove and discard the tough outer leaves of the frisée and escarole to use their tender, sweeter pale center leaves. Wash and dry, then chop or tear into bite-size pieces and place in a bowl. Trim off the bases of the Belgian endives to free the leaves and add the leaves whole to the bowl. Cover with a paper towels and refrigerate until use. In a large bowl, whisk the egg vigorously, then whisk in the olive oil, garlic, anchovies, lemon juice, vinegar, cheese, and pepper, creating a thick but not emulsified dressing. Pour the dressing over the greens and toss thoroughly, using your hands to help coat the leaves if necessary. Season to taste with salt. Arrange the salad on a cold serving platter, grate more cheese over the top, and serve right away.